Save 27% off the regular price! Pre-order "Bert and Ernie's Great Adventures" on DVD. By pre-ordering you're guaranteed the lowest possible price. If the cost is reduced before the release date, you'll get the additional savings automatically. Experience all-new adventures like never before with Sesame Streets favorite comedic duo as Warner Home Video (WHV) and Sesame Workshop, the nonprofit educational organization behind Sesame Street, team up to release Bert and Ernies Great Adventures on DVD April 6, 2010. The DVD features the beloved Sesame Street Muppet roommates appearing as clay characters for the first time on DVD taking preschoolers on exciting and fantastic journeys that are sure to open up their imaginations. 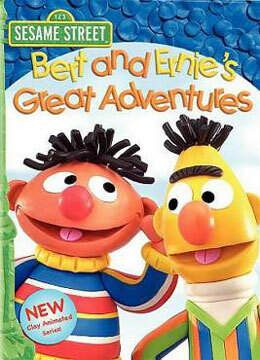 Bert and Ernies Great Adventures will be available on April 6, 2010 with an SRP of $12.99. Bert and Ernies Great Adventures contains a compilation of 13 exciting adventures in 50 minutes of fun for preschool children. 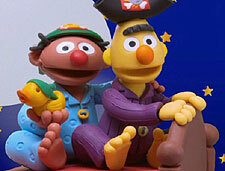 Join Bert and Ernie as they search for buried treasure as Pirates, ride horses in the Wild West and swim with the fishes in the Deep Sea. The adventures continue as they help out an Arctic friend in Penguins, run from dinosaurs in Cavemen and cook up a mess in Bakers. Children will delight in the characters cool Claymation look and the fun and creative stories. Celebrating its impressive 40th anniversary this season, Sesame Street is the longest-running program in childrens television. The series has received more Emmy awards than any other show in television history, including a Lifetime Achievement Award honoring the 40th year.